Some of the software that I have written. C++ project and Visual Basic. Some of these were for coursework at University and some were just because I felt like writing them. This software project has it's own page here. 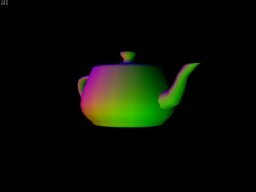 I wrote this program to learn about 3D maths and the positioning and manipulation of objects in 3D space. 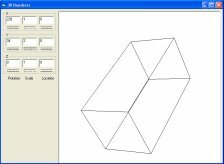 The program simply displays a cube in wire frame and allows you to rotate, move and scale the cube along the X, Y and Z axis. This is all done with transformation matrices. Since I only wrote this program to learn the basics of 3D graphics it is not written for speed which doesn't really matter as a cube is a relatively simple object so the frame rate is still high. The source code and .exe file can be downloaded here (23 kb). I wrote this program after getting a new mobile phone with a game called Super Mind on it. Super Mind is a bit like master mind where you make guesses about what a number is and then are told something about your guess. The more guesses you make the more information you get and you should eventually get the right answer. A friend of mine joked that I should write a program to guess the correct number so I decided to. The program is not very intelligent and just eliminates any of the 10,000 possibilities that cannot be the correct answer according to the information that has been collected already. It then randomly selects one of the remaining possibilities and uses that as a suggestion for the next move. After completing my intelligent systems course at university I have considered re-writing the program using some heuristic search to see if the program is any better at guessing the answer but I have not got around to this yet. The source code and .exe file can be downloaded here (18 kb). This project was the course work component of my Visual Basic course. The brief was to write a web browser using the web browser control supplied with Visual Basic. The main part of the project was to do with creating classes to hold bookmarks to sites. The user had to be able to add bookmarks and any other features such as searching through the bookmarks or organising them was a bonus. This was a group project. In my group I did all of the coding and my other two group members did the documentation and the toolbar at the top of the window. This project received the top marks in the year, you can see what marks we got here. The class test mentioned is out of 10 and the project mark is out of 50. Each of the sections (Requirements analysis, design, coding) are marked out of 10. The source code and .exe file can be downloaded here (55 kb). The documentation for this project can be seen here. This is the coursework for my Intelligent Systems course. The brief was to write a program that will answer questions in natural language about rooms in a hotel. It also had to make reservations and remember which rooms were free and who has booked them. You can download the program and instructions here (755 kb). Requirements: As far as I am aware this should run on all windows platforms. This was the first course work project for my C++ course at university. The spec was to write a program to simulate a vending machine. The simulation was to keep track of coin and item stocks, how much money a customer had put in, dispense the right change and so on. The source code and .exe file can be downloaded here (267 kb). Requirements: The .exe file should run on all windows platforms. To compile the program you will need visual C++ 6.0.